Pepperl+Fuchs: From small stations to large chemical plants: Wherever dangerous process media are used and temperature extremes prevail, Pepperl+Fuchs’ explosion-proof products ensure the protection of personnel and equipment. Our development and production teams are continually improving the portfolio and incorporating feedback from customers and experts. 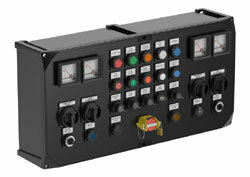 A new enclosure series was developed with the aim of simplifying planning, mounting, and maintenance. Adapted to process industry requirements, this glass fiber reinforced polyester (GRP) enclosure series is is being rolled out for terminal boxes and control units first. It will be available for all Pepperl+Fuchs products and solutions in the future.